Please do not transport bikes on hitch rack, this covers the bike in salt. Be mindful of leaning the bikes up against each other, or metal on your vehicle. This will scratch the bike and you will be responsible for this, along with any other things you may break. Dress warm, but not too warm. If you are just starting out and you are a bit chilly, you should be perfect after a few minutes on the bike. Bring an extra layer in case of mechanical, weather change, or if you get cold for some other reason! Water, Don’t forget to drink it! Tire pressure it very important, if you notice you are sinking into the snow try letting out a bit of air. 1-2psi is not out of the question for these bikes. Seeing a fold in the tires sidewall is a good sign that you have good pressure for soft snow conditions. Where do I ride? The south Trails Snow Bike Route (SBR), is a machine groomed beauty that starts from the south trails parking lot off of hwy 553. Conditions can be variable on this loop, it is a good idea to check the NTN facebook page for a grooming and trail conditions report. North NTN Trails, (orange loop, Collinsville, Blue Heron, and Collinsville extension) Start from trail head on 550 near Park, or from the Board of Light and power off of Wright street. These trails are mostly human packed, after a fresh snow they may be a bit soft, however most of the time conditions are consistently great! 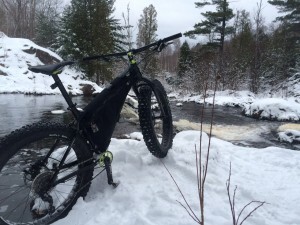 RAMBA Snow Bike Trail (SBT) This human and machine packed ride connects the towns of Ishpeming and Negaunee. There are many places to access this trail, we suggest parking at Old Town Park in Negaunee, this way you can ride the main loop. You can ride it as a lolly pop loop from The Jasper Ridge Brewery if a few more miles. There are also many snowshoe trails you can take off this, adventure is on your side! Check out www.trailgenious.com for detailed maps and videos. Feeling adventurous? Park at Harlow lake, Lil Presque, or Wetmore landing. Check out the snowshoe trails, Lake Superior beaches, and cool ice shelves. RIDE AT YOUR OWN RISK, THESE TRAILS ARE NOT GROOMED, OR MARKED! You may encounter other riders, walkers, skiers, snowshoers, dogs, deer, squirrels, or Yetis. Please be kind and respectful to all of the user groups, if you see a Yeti take a picture we would love to see it! Need a map? We have those too!